Serving the Greater Seattle Area, including NE Seattle, West Seattle, Central Seattle, Ballard, Fremont, Wallingford, Greenlake, Greenwood, Ravenna, Bryant, Shoreline, Wedgewood, Lake City, Lynnwood, Edmonds, and Bellevue and Mercer Island. We return phone calls usually as soon as we get off the roof! 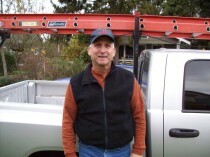 Serving Seattle, Lynnwood, Shoreline, Bellevue, Kirkland for 30 years!